Understanding and Using the "Main device fail to operate, use upstream devices" Option in PTW V7.0. Proper maintenance and testing of protective devices are essential to the integrity and safety of the equipment and overall power system. When the main protective device fails to operate during a fault, it will lead to an unintentional time delay that will affect the results of the Arc Flash Analysis. Since the clearing time of protective devices is one of the key components of the Arc Flash study, it is important to anticipate as to when the fault will clear for every possible scenario such as the failure of the main protective device. 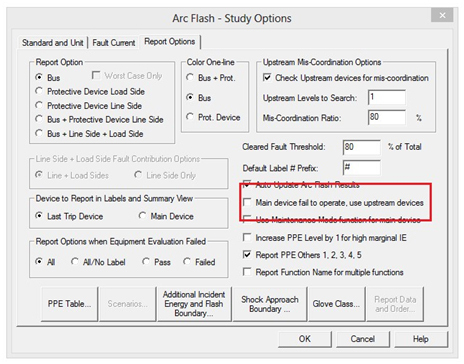 In PTW, the option "Main device fail to operate, use upstream devices" in the Arc Flash Study Module, enables the user to see the resulting Arc Flash incident energies when a failure of the main device occurs. The main device is defined in the program as the protective device that carries the most fault current to the bus. Usually, this is the device that protects the equipment from the line fault current (eg. Main breaker of the Motor Control Center or Main switchgear, etc). When this option is applied, the program will ignore the main protective device and look for the next upstream device to trip. The arc flash event occurred at the bus or at the line-side of a protective device. The first upstream overcurrent protection device from the main overcurrent protection device is the one that clears the arc flash event. As an example in Figure 2, the breaker Main CB is the main protective device for the PANEL bus. Figure 3 shows the arc flash table of results for an arc flash event on location PANEL. The option Main device fail to operate, use upstream devices has been checked and a maximum arcing time of 2 seconds is applied. The reported protective device is shown as MDP-CB, which is the upstream overcurrent protection device as seen in the circuit diagram in Figure 4. When the main device Main CB failed to operate, it trips MDP-CB at about 15 seconds based on the Time-Current Characteristics plot on Figure 4. Since the trip time is more than the maximum arcing time set for the study, the Incident Energy is calculated based on the Trip/Delay Time of 2 seconds. On the PPE Level column, it is marked as *N22 and the name of the main overcurrent protection device Main CB. The code *N22 is explained as "Main Device failed, use upstream device". In comparing the trip curves between the main and upstream protective devices, it can be visualized that the upstream overcurrent protection device is much slower to clear the arcing current than the main overcurrent protection device. 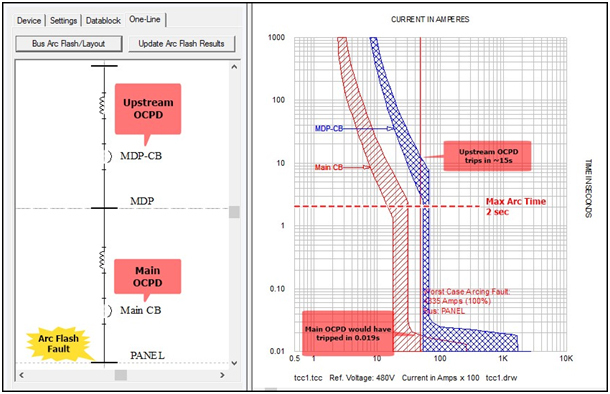 Without the option "Main device failed to operate, use upstream device" applied, the incident energy (at location PANEL) would have been 0.28 cal/cm2 since the arcing current would have been cleared by the main device (MAIN CB) at a faster time of 0.019 seconds as shown in Figure 5. With this option applied in this case study, the resulting incident energy showed a higher value (30 cal/c m2) which revealed a very large discrepancy. This may lead to serious safety concerns if this scenario is to occur since workers will be under-protected. Obviously, maintenance of protective devices is extremely critical to the safety of the system and its workers and is the key to prevent reaching the state of having unintentional delay in the protective devices due to failure of operation. The situation may be improbable when proper maintenance is established. However, having the option to analyze the study for possible failure of these devices would further help companies design their safety program or improve the protection scheme of the power system to prevent catastrophic consequences.